The spatial sound installation TopoPhonicPlateaux is a sound-light body in which the listeners can walk about, the acoustical and optical conditions of which are continually changing. Electro-acoustical sound, instrumental sound, human voice and noises (i.e. every kind of audio material) are interwoven with one another and give rise to a complex speech character which breaks down boundaries and establishes itself between traditional genres such as electronic music, radio play or “musique concrète”. The texts used are taken from Nächte und Spindeln (Nights and Spindles) by Jochen Beyse and Gödel, Escher, Bach by Douglas R. Hofstadter. Inspired by Hofstadter’s application of contrapuntal principles to the presentation of the text, the spoken material is chiefly subjected to musical criteria in the presentation of polyrhythmical planes, contrapuntal speech melodies and repetitive structures, i.e., speech syntax and semantics are dissolved in sound. The only acoustic instrument in the sound-body is the computer-controlled concert grand piano, which thus takes on an exposed position within the installation. In addition, the computer control makes it possible to programme passages which would be impossible for human beings to play on the piano, which then sometimes take on affinity to electronic music – for example, when glissando lines are heard ppppp, which are rather more reminiscent of the soft purring of an electronic tape than of the sound of a piano. 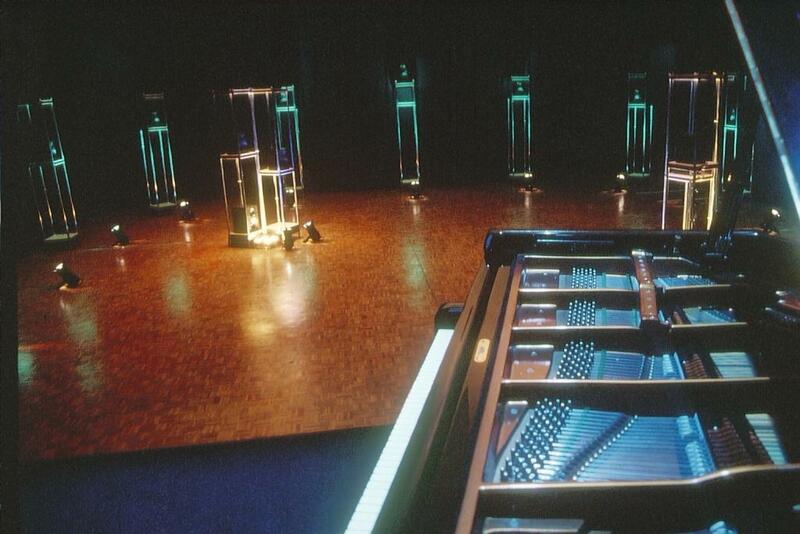 The digital synchronization of the piano with the loudspeaker installation has the effect of combining the heterogeneous levels of sound to create one sound-body “playing” together. The loudspeaker ensemble together with the concert grand piano and the lighting give rise to sound-light territories which again open up new scenes, create metamorphoses. They change, coupled with one another, flowing and broken-up, create complex worlds of fleeting acoustical and optical impressions of the planes of thought opened up to the external world. 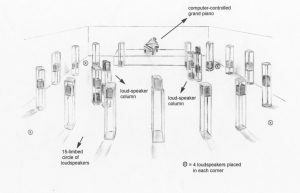 1. an outer circle consisting of 15 loudspeakers starting at the right edge of the stage and finishing at the left edge of the stage. The loudspeakers are positioned at a successively increasing, then again succesively decreasing height. 2. 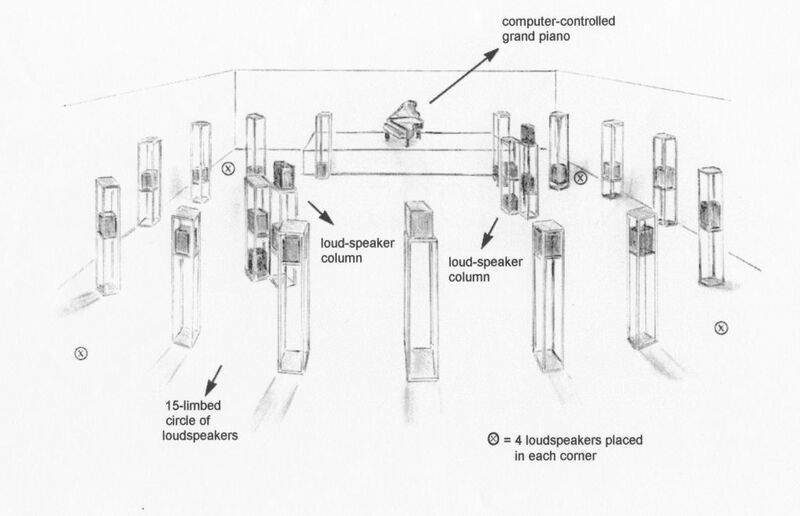 Two columns consisting of 4 loudspeakers each, which oppose each other in the inner space. Here, the heights of the loudspeakers are staggered. 3. Four aura loudspeaker boxes, which have been placed in each corner of the room. This group of loudspeakers provides an acoustic ground in the room, transmitting the bass frequencies. 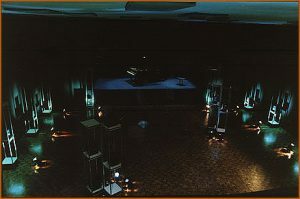 The computer-controlled grand piano is present on the stage. It is synchronised by a computer with the loudspeaker configuration. In the performance, a Bösendorfer computer-controlled piano is used.